Grub, I'm sorry, I didn't mean to suggest that the origins of the dish labskous were English - I just worded my sentence very clumsily. What I meant to say was that the oldest version of the dish as it appears in English cooking seems to be based on the sailors' version! I'm sure you're right. By the way, Grub and Klary, I've heard that bread-thickened stews are still common in Scandinavia - are they part of traditional Dutch cooking too? And if so, are they associated with particular areas? Klary, this thread is fantastic. I know very little (well actually almost nothing except the butter cakes that are not very good sold in a local coffee house). I just have to make those Gevulde koeken. They look heavenly and I love almond paste goodies. Thanks for some wonderful recipes and a look at traditional Dutch cooking. Klary has put many of her recipes into RecipeGullet -- you can find them here. RecipeGullet has a neat feature (one of the buttons at the bottom of the recipe screen) that automatically converts from metric to US measurements and the other way, too! Cheers to a job well done Klary...not go put your feet up and have a beer! we would eat often a couple of nights in a row, chicken braised with butter was definitely a luxury dinner for Sundays and holidays. Is/was chicken more expensive? In our house, we more often think of chicken than beef as a budget meal! Chicken is not really more expensive (if you buy the cheapest, batterychickens it's cheaper than beef) but since my father was a butcher until his retirement, and the meat was practically free, the chicken was more expensive and considered a luxury item! 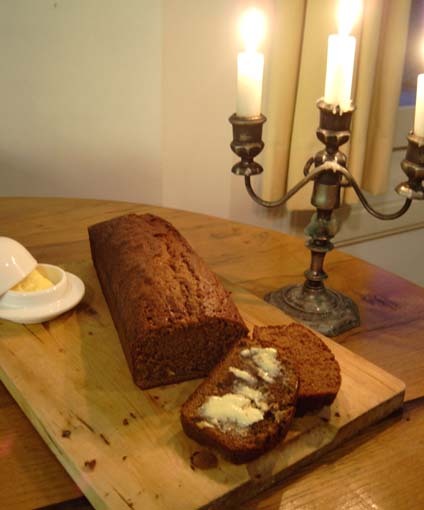 There is a tradition to thicken the juices of the butter braised beef with a slice of soft gingerbread. Not sure if that's only done in certain regions though. I don't know of any braises that are thickened with ordinary bread. 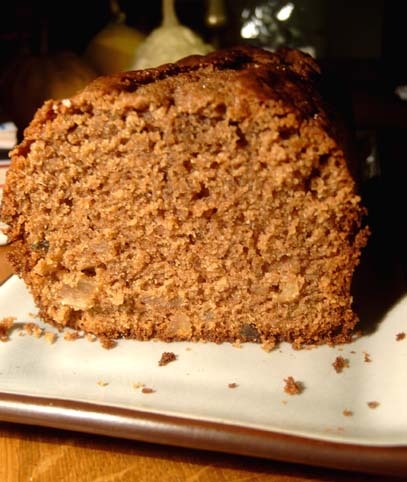 A slice of soft gingerbread! Wow! Thank you so much for your work showing us Dutch cooking - it's really nice to see the materials and the process, as well as the finished dish. Again, thanks everyone for all your kind words. And thank you snowangel for the post with the links! 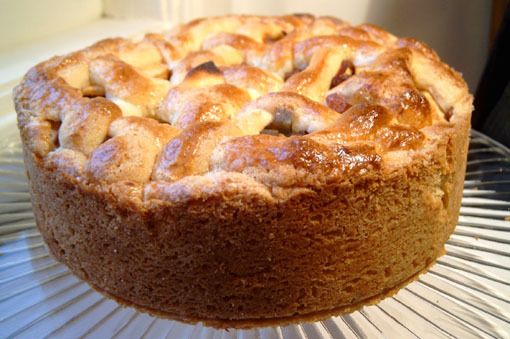 Here's another one.. appeltaart , apple pie. 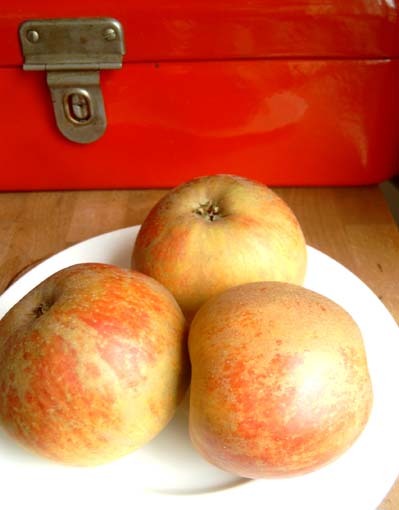 The traditional apple to use is the goudreinette, which I think is known abroad as Belle de Boskoop. It is a large, tart, crisp apple that doesn't fall apart when cooked in the pie. 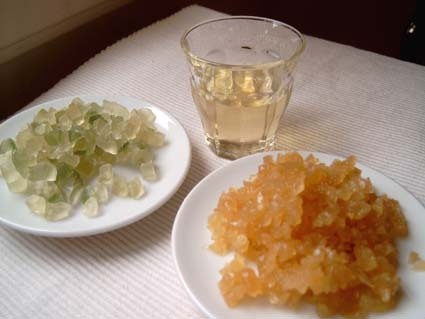 Sucade is the candied rind of a fruit called citrus medica. I've never seen the fresh fruit. 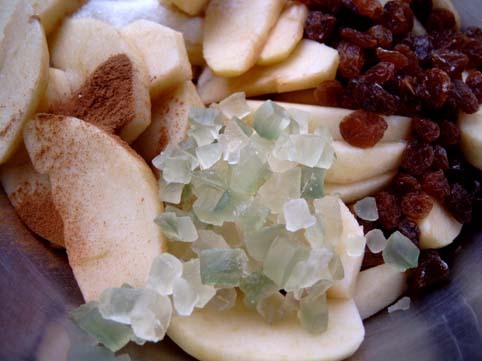 The candied rind is used in applepie, in the famous newyears eve fritters oliebollen, as a flavouring in raisin- and gingerbread. It's a bit oldfashioned to use in homebaking but I like it and it's pretty.. It has a sweet, slightly orangey flavor and a chewy texture. Mix all the ingredients for the dough together and use about 3/4 to line the springformtin. 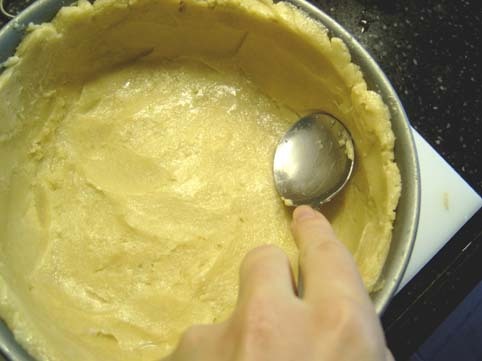 The dough will be sticky and a bit hard to handle, the easiest way to get it into the tin is to put clumps of it on the bottom, and then use your fingers (dipping them in cold water every now and then to prevent sticking) or the back of a spoon (ditto) to spread it evenly over the bottom and sides. Peel, core and quarter the apples and slice them thinly. 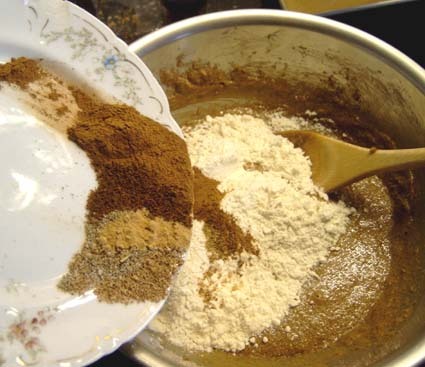 Mix with the other filling ingredients and put in the tin (If you use apples that will collapse during cooking and will shed a lot of liquid, put a handful of breadcrumbs or a layer of oatmeal on the bottom before putting in the filing). 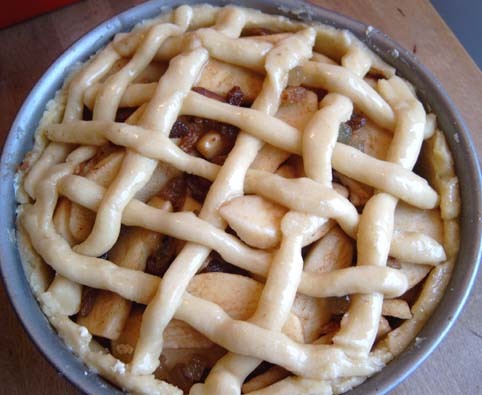 Roll the leftover dough into thin strips with your hands, and use them to make a lattice pattern on top of the filling. Glaze with the beaten egg. Bake for about 50 minutes at 175 C / 350 F, or until golden brown and risen. Don't overbake or it will be dry. Here you can see how the appleslices have held their shape, and the texture of the crust. In Holland applepie is often served with whipped cream, with a cup of morning coffee. That pie is beautiful Klary, and well-timed! Hopefully someone will be able to add it to their Thanksgiving menu and report back...alas, my family will be eating at a restaurant this year (since we have lots of people and a wedding over the weekend), so I'll have to wait a little while to try this out. ETA: For those of you who don't read the Dinner! thread, I made the butter-braised chicken for my little bro on Sunday, and it was a big hit. Delicious - Klary was right on about the gravy. Wowza. 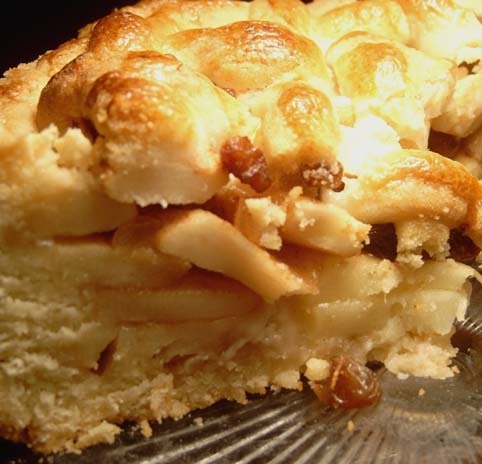 The Appeltaart reminds me of my grandmothers Apfel Kuchen. According to http://www.kingherb.com, citrus medica is called finger citron or buddhas hand citron in English. They also give a transliteration of a Chinese name, fo shou. 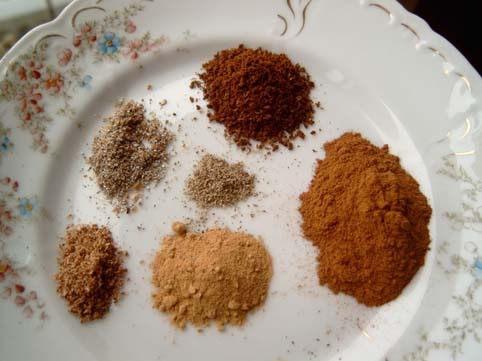 http://www.dreddyclinic.com/ayurvedic/herb...dic_herbs_c.htm gives the English name simply as citron, which I suspect is correct. I could see where candied citron would go well in an apple pie. Oh Good Grief! I have spent quite a bit of time in Amsterdam and The Hague and I have never found such a treasure as this on Dutch cooking. And, believe me, I have looked. I mean treasure in the truest sense of the word. I can't thank you enough. I want to report that I made a speculaas flavored panna cotta that was fabulous. I did a regular panna cotta with a bit of honey and vanilla, and added a couple of teaspoons of speculaas spices. Since I was serving it with vin de noix, I also added a tablespoon of that, but you wouldn't need to. It made a really delicious, ultra-simple holiday-tasting dessert. I would love a nice recipe for a dish I encountered in Arhem or anything. If anyone has a recipe like this, please tell me.. It was the most simple thing: White aspargus baked with some great quality ham, and boiled eggs. and that was it. A nice warm rustique creation. And why are the dutch so crazy about peanuts?? Abra, that sounds delicious. What a great idea. Now I am thinking that maybe speculaasflavored creme brulee might also work.. what do you think? 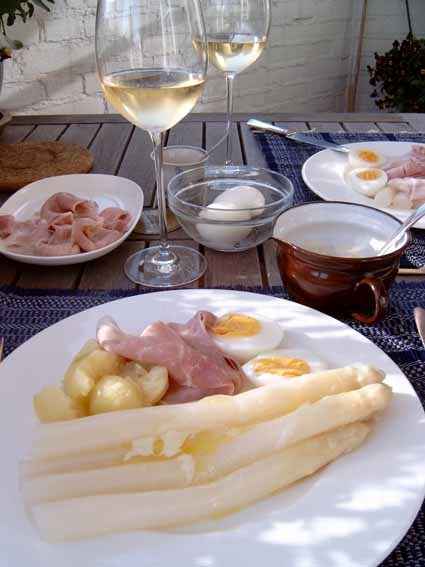 is the traditional way to eat white asparagus (when in season): with new potatoes, boiled eggs, ham and lots of melted butter. Was the dish you had, asparagus and ham baked together like a gratin? was there cheese on it, or just butter? For the Citrus Medica, what do you recommend for a substitute? I wanted to make your pie for thanksgiving. My dutch grandfather should like it. If anyone has a substitute suggestion I would appreciate it. Please keep in mind I will be doing this baking out in Iowa, no access to Whole Foods or ethnic grocery stores. In the U.S., you can use the candied citron that they sell at holiday time for use in fruitcakes and pannetone. In California, at least, it's sold in translucent plastic tubs, in the produce section with other candied fruits (such as those nasty fake-red cherries and ultra-green pinapple), or sometimes on the baking aisle. You usually can only find it from October through Christmas. You can also buy it mail-order from a variety of internet sources, if you find yourself in need of it during the off season. Edited to add: You could also just use golden raisins (in addition to the dark raisins) in its place. 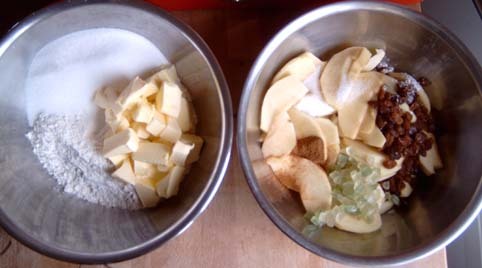 I have a few recipes for dutch apple pie that don't have citron at all. In the U.S., you can use the candied citron that they sell at holiday time for use in fruitcakes and pannetone. ScorchedPalate, thanks for the info on candied citron. Poffertjes, you could also add some candied orangerind. A friend of mine always adds some chopped up dried apricots to his applepie. Like the citron, this adds not only flavor, but texture. Don't soak them so they stay a bit chewy. edited to add: I'm now thinking that for Thanksgiving, maybe dried cranberries would make a nice addition to this pie! Sure, I think speculaas creme brulee would be yummy. Some of the spices drifted up to the top in the gelling process of the panna cotta, making a very slightly crunchy spicy top layer that was really nice. This makes a very spicy, 'adult' gingerbread. I like it like that, but if you want a sweeter, mellower version, omit the pepper and powdered ginger . the flour, salt, syrup, milk, ginger and citron. Mix well. Pour into a greased cake tin, lined with baking paper (I used a 10 x 30 cm loaf tin). Bake for about 1 hour, until well risen. A toothpick inserted in the center should come out dry. Is the gingersyrup the syrup from bottled, preserved ginger, or something you make? I detest citron, so I'm glad to see that (optional) next to it! I changed 'crystallized ginger' to 'preserved ginger' in the recipe, sometimes the translation-thing confuses me.. The sucade (citron) is optional, I only put it in because I had some left after making the applepie. Although you can buy gingerbread in the shops over here that is loaded with citron!! I made your apple pie yesterday Chufi, and my enthusiastic family finished it up for breakfast. It's too early in the season here for the fresh Buddha's hand citron, and I didn't preserve any citrus peel last year, so I added thickish shreds of tangerine/mandarin peel. I made the gingerbread today, Chufi, and it was a great success with everyone. What a wonderful recipe, thank you.